Bruins Head Coach Claude Julien informed reporters after Saturday’s practice sessions that first round draft pick David Pastrnak tweaked his shoulder during the morning session. Pastrnak left Saturday’s morning session after falling into the boards after colliding with defenseman Matt Bartkowski. Pastrnak did not play in Sunday’s scrimmage and is not expected to appear in Tuesday’s preseason game against the Montreal Canadiens, though the team still holds hope that he will appear in a few preseason games. The 18-year-old Czech native has been playing right wing on David Krejci’s line for the start of camp. With a major presence in both development and rookie camp, the possibility of Pastrnak making the roster isn’t that far-fetched. Whether or not his absence will affect his chance of making the team, Julien doesn’t know. 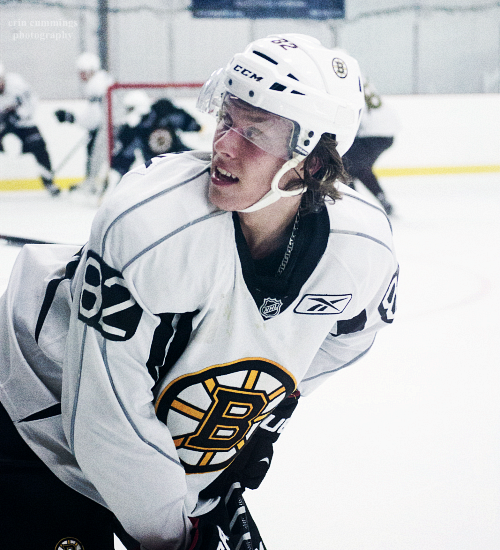 Pastrnak has had quite the buzz around him since being invited to training camp. Despite his offensive skill, the forward weighs in at 170 pounds; his size has been a concern from the start, and this injury is doing nothing to quell that. Let us know your thoughts. Follow @ryescaf and the BruinsLife team @BruinsLife.